WASHINGTON (CNN) -- President Bush on Tuesday declassified intelligence showing in 2005 Osama bin Laden planned to use Iraq as a base from which to launch attacks in the United States, according to White House spokesman Gordon Johndroe. Johndroe said the intelligence was declassified so the president could discuss the previously secret material on Wednesday during a commencement address at the Coast Guard Academy in Connecticut. The speech will be aimed at defending a key part of the president's war strategy -- the contention that the United States cannot withdraw from Iraq because al Qaeda would fill the vacuum in the Middle East. "This shows why we believe al Qaeda wants to use Iraq as a safe haven," said Johndroe. He added the president will talk about al Qaeda's "strong interest in using Iraq as a safe haven to plot and plan attacks on the United States and other countries." Bin Laden and a top lieutenant -- Abu Faraj al-Libbi -- planned to form a terror cell in Iraq in order to launch those attacks, Johndroe said. Al-Libbi was a "senior al Qaeda manager" who in 2005 suggested to bin Laden that bin Laden send Egyptian-born Hamza Rabia to Iraq to help plan attacks on American soil, Johndroe said. Johndroe noted that bin Laden later suggested to Abu Musab al-Zarqawi, then leader of al Qaeda in Iraq, that America should be his top priority. That was followed in the spring of 2005 with bin Laden's ordering Rabia to brief al-Zarqawi on plans to attack the United States, Johndroe said. Johndroe added the intelligence indicates al-Libbi later suggested Rabia should be sent to Iraq to carry out those operations. But al-Libbi was captured in Pakistan and taken into CIA custody in May 2005. After al-Libbi's capture, the CIA's former acting director, John McLaughlin, described him as bin Laden's chief operating officer, the No. 3 man in al Qaeda. "Catching terrorists is sometimes like trying to solve a jigsaw puzzle without seeing the picture on the box," McLaughlin said at the time. "This is a guy who knows the picture on the box. He knows what the big picture is." Al-Libbi is a Libyan who joined al Qaeda in the 1990s and fled to Pakistan after the United States invaded Afghanistan in late 2001. U.S. officials say al-Libbi was in contact with and directing alleged al Qaeda members in the United Kingdom who were planning attacks there and in the United States. He was also believed to be behind two 2005 attempts to assassinate Pakistan's President Pervez Musharraf. Rabia took over al-Libbi's position in the organization but was killed in in the North Waziristan tribal area of Pakistan near the Afghan border in December 2005. Jordanian-born al-Zarqawi was killed by a U.S. airstrike north of Baghdad in June 2006. 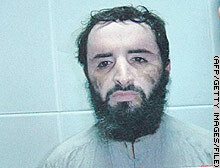 Abu Faraj al-Libbi was captured in Pakistan in 2005. According to newly declassified intelligence, he was supposed to help set up an al Qaeda base in Iraq.